This beautiful 2 Bedroom apartment is on the first floor of a large 3 story duplex. Home is just 100+ steps to beach entrance. First floor for rent has a quite front porch to enjoy ocean breezes at night and watch walkers, rear patio/barbecue area and outside showers. Is a smoke free and pet free unit with a nice bright beachy decor. Interior consists of a large 3 sofa living room with entertainment center, full bath, full kitchen, 2 large bedrooms w/ queen beds, plus utility room with modern washer and dryer & room to store bikes and toys. Installed new air conditioning last year. Rear patio has patio set for 6 with grill to cook full dinners and grassy yard offers a play area and room to stretch out. The rear yard is a real plus with children to play in a fenced yard. Adults like the privacy and relaxing features after a day at the beach. A night out back is one less day on the Boardwalk. Includes two off street parking pads. We have rented 100% of the Summer weeks for the past 11 years in a row. Families like the closeness to the beach so they can bring kids back to house easily and leave beach chairs at beach set up. Every week the unit is cleaned and ready. The beds are comfortable, the living room sofas are comfortable, kitchen and bath are modern. Bill owns several apartments and is an experienced landlord. He tries to make accommodations comfortable and modern. Bill lives upstairs and is available to make your stay the best vacation ever. This apartment has nice size rooms with comfortable furniture, a full kitchen @ laundry, a full patio, full Comcast on tvs, and ........very close to the Beach. The house is the 4th house from the beach entrance. It also has a nice rear patio that feels like home. House is the 4th house from the beach entrance. kitchen sitting for six with added leaf. We had a family reunion in this quaint beach town outside Atlantic City. This 2 bedroom first floor met our needs on a quiet street. No dishwasher, so we bought plastic cups and plates. Be prepared to bring your own towels though. Bill, the owner was very nice. We rented this apartment Memorial Day weekend for my daughters beach soccer tournament. Bill met us inside and took the time to walk us through and show us where everything was and how it works. Very clean and quiet. Less than a 2 minute walk to the beach. Would definitely rent this place again. Thank you so much, your review means a lot. Keep my email Bill.snyder@aig.com & my phone # (609) 314-1114. You can rent directly or your friends and avoid the VRBO rental fee. You really were a lovely family, and like it when my guests enjoy themselves. My wife and I have stayed at this property several times over the past few years most recently in 2016 and are looking to book again in 2017. 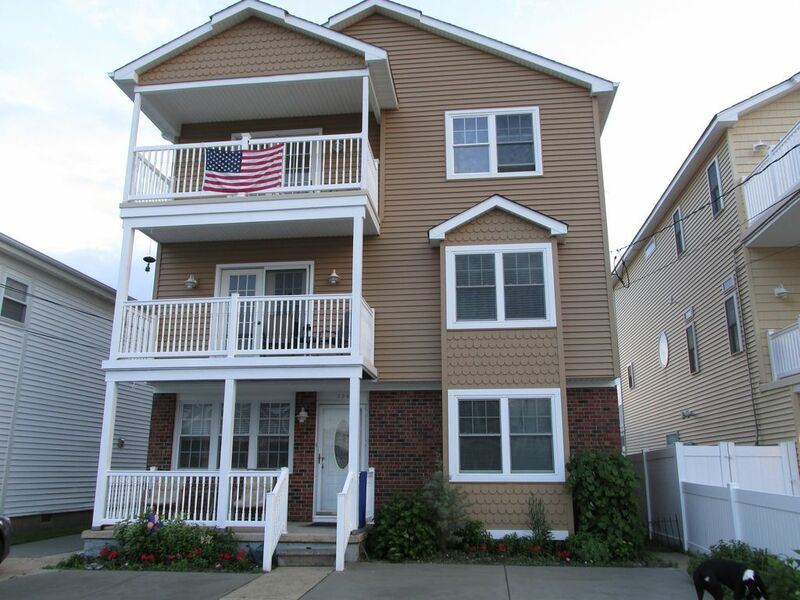 It has great access to the beach which is within a half block walk. Good plus is that Bill provided beach tags which made life easy. Other rental we've stayed at did not have them available and we had to purchase our own. Highly recommend this rental. This was the first time my daughters and I stayed at this property. The house was immaculate! The furniture was nice and comfortable; the kitchen was well stocked. Outside was a large yard with a patio and grill that made cooking easy after spending the day at the beach. Enjoyed sitting on front porch watching people walking to beach. I rented this apartment with my wife, two kids and my sister and her husband last summer. This is the first floor of a three story house. Booking was very easy and the owner gets back to you very promptly. However.... Upon arrival the apartment was very dirty. We had to also clean all of the air conditioning filters as it looked like they hadn't been cleaned all summer. During our stay the bed in my sisters bedroom was found to be broken and when we reported it, nothing was really done. We had to prop the frame up on one of our bags so my pregnant sister wouldn't fall out of the bed. Upon checkout we cleaned the apartment and left it in better condition then we found it. After numerous attempts to contact the owner about our security deposit we still have not received it to this day. Stay away from this first floor apartment. At the Beach in Brigantine. 5 Minutes from Atlantic City casinos and world class restaurants and boardwalk amusements, 20 Minutes from Ocean City Amusement Parks and Boardwalk. 100 steps to beach entrance. Bike paths, tennis and more. Sleeps 6 comfortably. This is a no smoking and a no pet unit. I will rent to qualified groups for June with a large security deposit or parental cosigned lease.